The following is a typical Income Statement - also referred to as a Statement of Profit and Loss. Notice that this example includes sections for Revenues, Cost of Sales, and Expenses. This example is for a business that sells a service. Because this business provides a service, the Cost of Sales section is not needed. 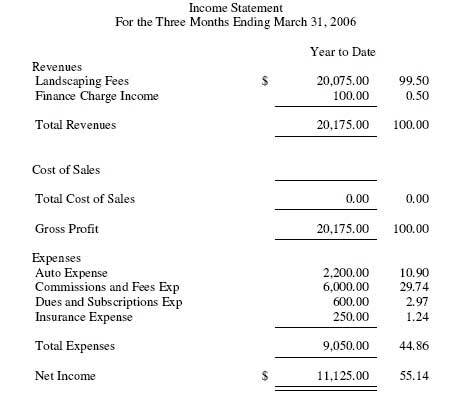 The Income Statement shown above is cluttered with needless information since it contains the Cost of Sales lines that will be $0.00 for most service businesses like this one. Since they will not be used, these lines can be deleted. Also, notice that without Cost of Sales, we will not need the Gross Profit line. 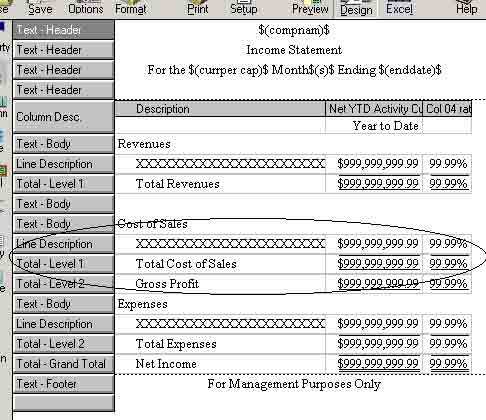 We can take care of these simple modifications by using the Income Statement Design Window as shown below. All we have to do is delete the lines that have been circled. The Income Statement from the top of this page has been reprinted below after the simple design changes have been made. 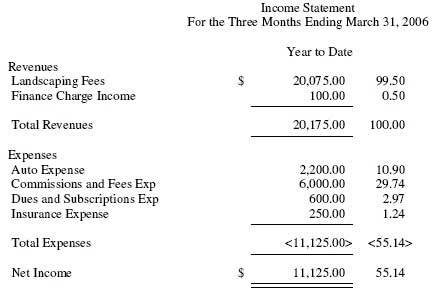 Notice how much easier the Income Statement is to read now that the clutter has been removed. Also, notice the column to the right. This column displays the percent of sales for each line of the Income Statement.